Just how the first of these cookies came to be is a source of cookie lore. While there are at least three versions to the story of how these cookies were first created, yet this much is known to be true. Ruth Graves Wakefield worked as a dietitian and lectured on food until 1930, when she and her husband Kenneth bought a Cape Cod-style house near Whitman, Massachusetts. Originally built in 1709 as a toll house (part inn, part restaurant, part horse-changing station, and part toll collection booth for the toll road), the Wakefields turned it into a charming inn and restaurant for travelers, and named it the Toll House Inn. Ruth conceived and prepared recipes for the meals served to the guests at the inn. Complimentary sugar cookies were provided with every meal. Yet here is where the details get sketchy. Just how did chocolate chips make their way into one of those batches of cookies? One version of the story claims that Ruth sought to create a chocolate version of her famed sugar cookie. Her thought was to break two 7-ounce bars of Nestles semi-sweet chocolate into bits and mix them into the dough. When baked the chocolate bits would melt and become incorporated into the dough. Needless to say, the bits didn’t behave that way. Instead, the cookies emerged from the oven with chunks of chocolate nestled into golden delicious vanilla-based dough. Nevertheless, Ruth served the cookies, which were so popular with guests so she made them again. Another account claims that a version of Ruth’s sugar cookie recipe called for powdered baker’s chocolate. When Ruth found herself without the needed ingredient, she substituted two Nestles semi-sweet chocolate bars cut up into bits. However, the chopped up chocolate bar did not melt completely and the small pieces only softened. The result birthed a delicious, buttery sugar cookie with delectable chips of chocolate. Regardless of which version of the story is true, Ruth continued to bake chocolate chip cookies. As word about the treat spread, she began to fill cookie orders and even submitted the recipe for publication to several New England newspapers. GIs from Massachusetts stationed overseas during World War II received the cookies in care packages from home and shared them. Soon, Ruth was inundated with letters from around the country asking her for the recipe. In 1939, Betty Crocker featured Ruth’s chocolate chip cookies on her radio show, Cooking School of the Air, which spring boarded Ruth and her cookie to national attention. As the Toll House cookie recipe became popular, sales of Nestle' semi-sweet chocolate bars skyrocketed, particularly in the northeast. Andrew Nestle and Ruth Wakefield struck a deal. Nestle would have rights to print the Toll House Cookie recipe on its chocolate bar packaging (while also scoring the bars for easier breaking and including a small chopper with which to chop the bar into bits) and Ruth Wakefield would receive a lifetime supply of Nestle chocolate. In 1939, Nestlé began marketing chocolate chip morsels as a way to make it easy for the public to make chocolate chip cookies. Today, chocolate chip cookies are considered to be the quintessential American dessert and are the most popular cookies in the United States. 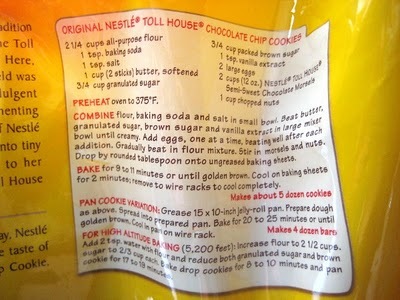 Nestle continues to print Ruth’s original recipe on its semi-sweet chocolate chip packages. What Happened to The Toll House Inn? The Wakefields sold the Toll House Inn in 1966 to owners who attempted to convert it into a nightclub. In 1970, the Saccone family purchased the property and returned it to its original form as an inn and restaurant. Ruth passed away in 1977. The Toll House burned down on New Years Eve 1984. Today, its site is commemorated with a historical marker. Follow The Cookie Elf's Chocolate Chip Cookies board on Pinterest.